Cargo Cycling: What do the KIDS think! Waking up whilst watching the sunrise! 'Daddy, how are we going to school today, can we go on the big bike'!? One of my two girls asks me, in rare unspoken agreement with her sister, it's something they both want to know and both want to hear only one answer too, yes!. The question is always close to the first of a never ending stream of questions for the day, the fact that it is asked so soon certainly ranks it high on their priority list. 'But sweety, it's really raining today and pretty cold'! - unusually reluctant to cycle, however today i'm not keen, it's wet and about 4 degrees, not that most mornings this winter have been much better. But to my painfully early waking children, (6yo, 4yo) it matters not one bit. How can I ever refuse a request to cycle, especially when its for the sheer joy of cycling. 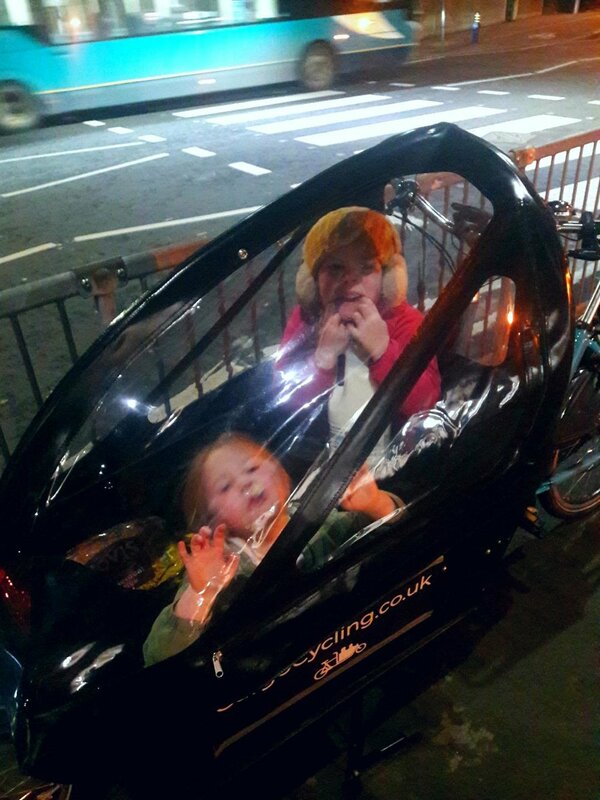 OK the girls wont be actually pedalling, in our Bakfiets Classic Long, my precious cargo sit in the box at the front of the bike with harnesses, while I sit above and behind, perfectly placed to watch the road around me and any action in the box. But without doubt they will benefit and enjoy almost every other positive cycling brings.....the feeling of speed, a connection to their environment a vehicle prevents, a fresh air wake up call to start their day, the fun mini games we play when riding (singing, puddle running, catching up fellow cyclists and what ever else their active minds come up with). In fact, as yet, we haven't had one ride on the bike that hasn't been enjoyable in one way or another for all of us. Which brings me back to the girls enthusiasm to ride, of all the difficult, late, hectic, unorganised and general messy mornings we have had during the school run, nothing, and I mean nothing works as a better incentive to eat breakfast/get changed/do teeth and....wait for it.... even PUT ON SHOES, than the promise of going to school on the cargo bike! And that is just the school run during winter, trips to the park, to town or shopping have all been made a lot more enjoyable with the bike, as a family we are very much looking forward to the adventures we can have when the weather gets better and brighter! So in short, what do the kids think? Pure fun and silliness aside, I am sure (as a cycle instructor) my girls are getting a very positive impression of cycling whilst picking up some good skills, and will take that forward as their riding becomes more independent. As for something even more valuable, good family memories, Id like to think and im pretty sure, riding on our cargo bike will be some of the few treasured ones that hold a certain glow of fondness in years to come. 'Ohhhh, OKAY' I sigh in defeat racking my brain, trying to think where I last put my warmest waterproof. 'seeing as its raining girls, shall we go through the Common and see if we can find some muddy puddles'? Of course, they like the after school ride just as much, if not more! We wish you a Cargo Bike Christmas!